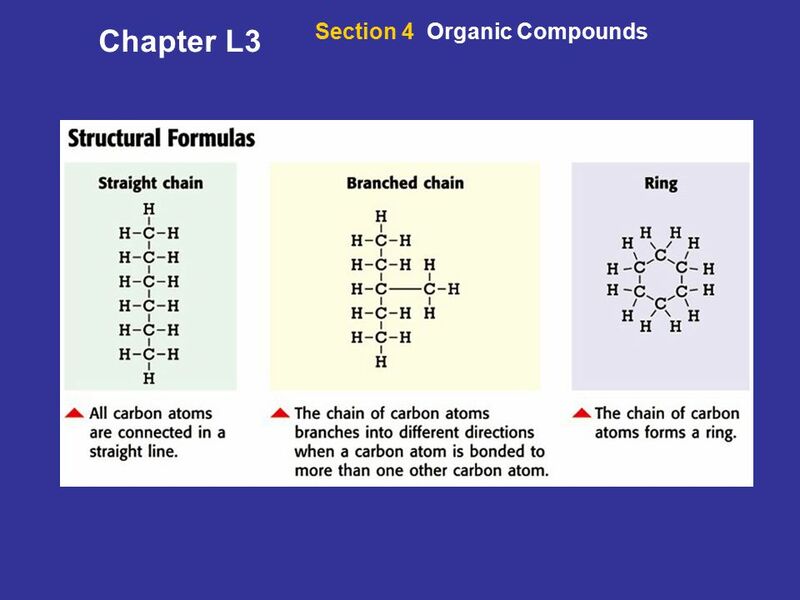 Chapter L3 Section 4 Organic Compounds The Four Bonds of a Carbon Atom More than 90% of all compounds belong to a group called organic compounds. Organic compounds are covalent compounds composed of carbon-based molecules. Fuel, rubbing alcohol, sugar, cotton, paper and plastic belong to this group. All organic compounds contain carbon. Each carbon atom has four valence electrons so each carbon atom can make four bonds with four other atoms. 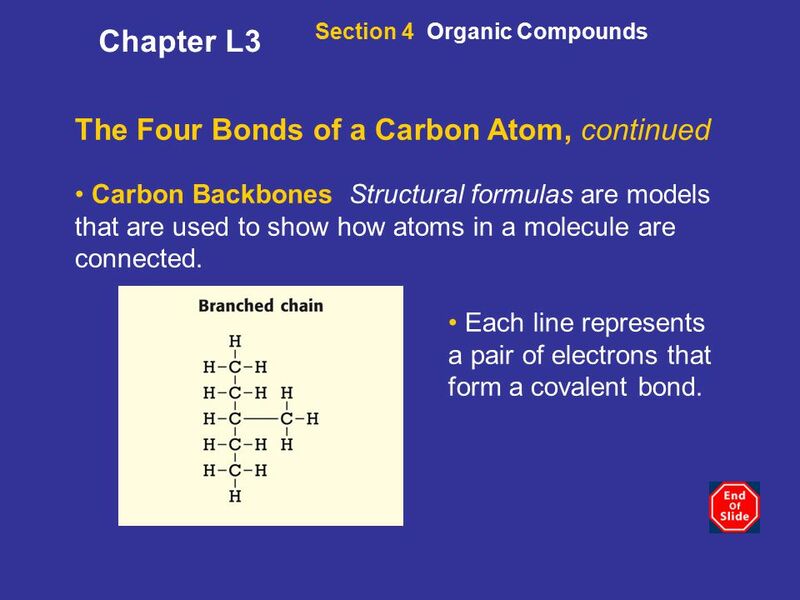 Section 4 Organic Compounds The Four Bonds of a Carbon Atom, continued Carbon Backbones Structural formulas are models that are used to show how atoms in a molecule are connected. Each line represents a pair of electrons that form a covalent bond. 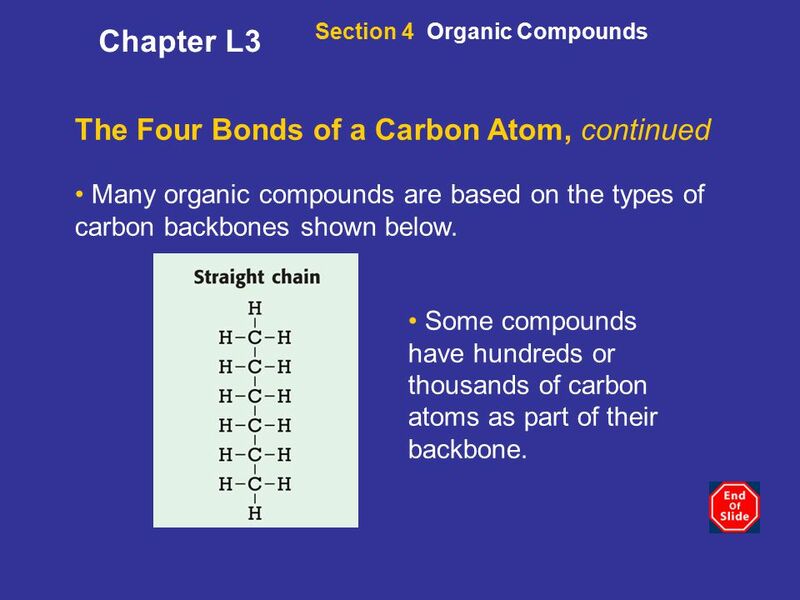 Section 4 Organic Compounds The Four Bonds of a Carbon Atom, continued Many organic compounds are based on the types of carbon backbones shown below. Some compounds have hundreds or thousands of carbon atoms as part of their backbone. Section 4 Organic Compounds The Four Bonds of a Carbon Atom, continued Organic compounds may also contain hydrogen, oxygen, sulfur, nitrogen, and phosphorus. The next slide shows three models of carbon backbones. Section 4 Organic Compounds Hydrocarbons and Other Organic Compounds Many organic compounds contain several kinds of atoms, but some contain only two. Organic compounds that contain only carbon and hydrogen are called hydrocarbons. There are three types of hydrocarbons: saturated hydrocarbons, unsaturated hydrocarbons, and aromatic hydrocarbons. 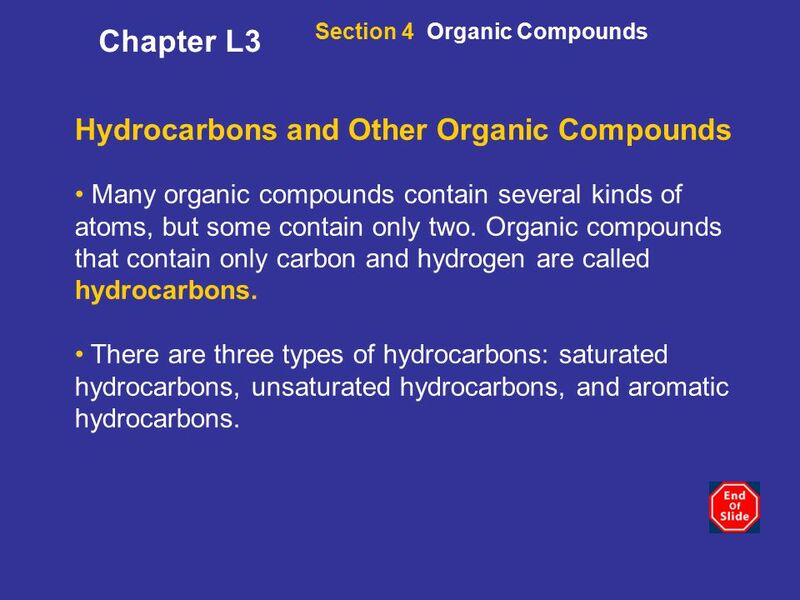 Chapter L3 Section 4 Organic Compounds Hydrocarbons, continued Saturated Hydrocarbons An alkane, or saturated hydrocarbon, is a hydrocarbon in which each carbon atom in the molecule shares a single bond with each of four other atoms. A single bond is a covalent bond made up of one pair of shared electrons. 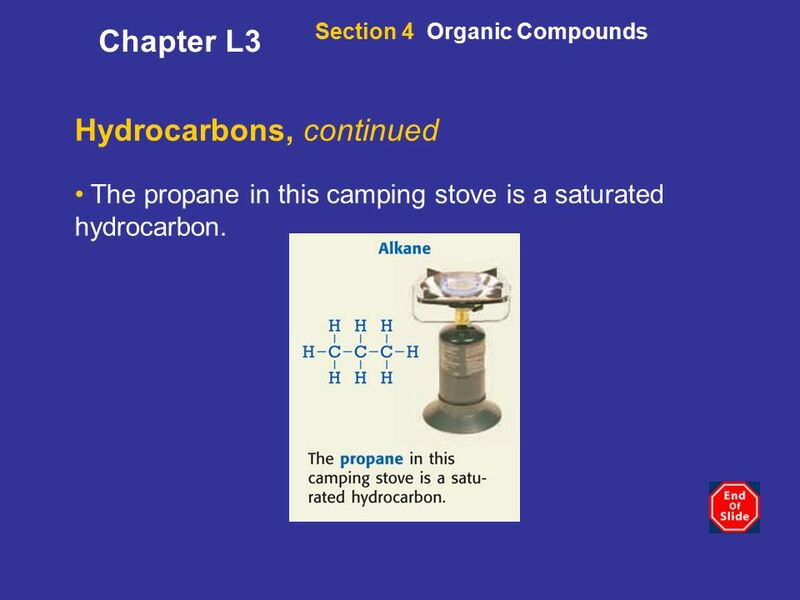 Chapter L3 Section 4 Organic Compounds Hydrocarbons, continued The propane in this camping stove is a saturated hydrocarbon. 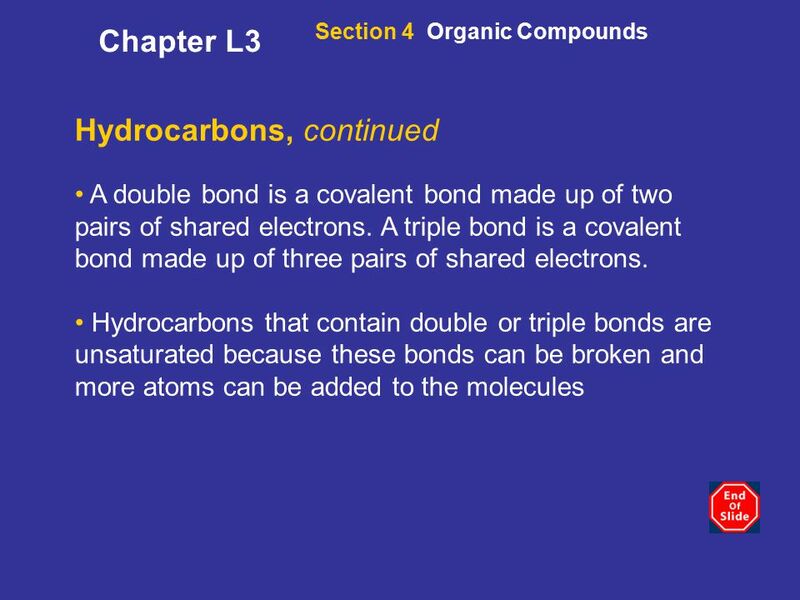 Chapter L3 Section 4 Organic Compounds Hydrocarbons, continued Unsaturated Hydrocarbons A hydrocarbon in which at least one pair of carbon atoms shares a double bond or a triple bond is called an unsaturated hydrocarbon. 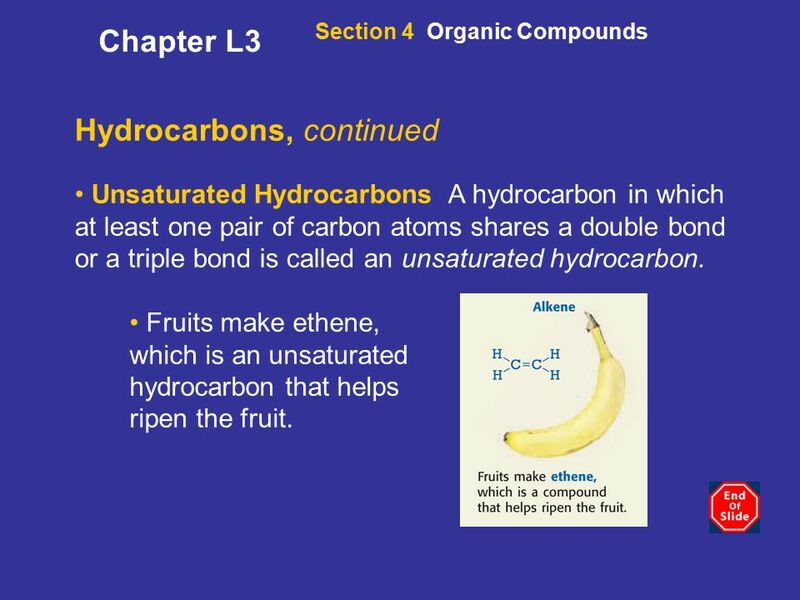 Fruits make ethene, which is an unsaturated hydrocarbon that helps ripen the fruit. 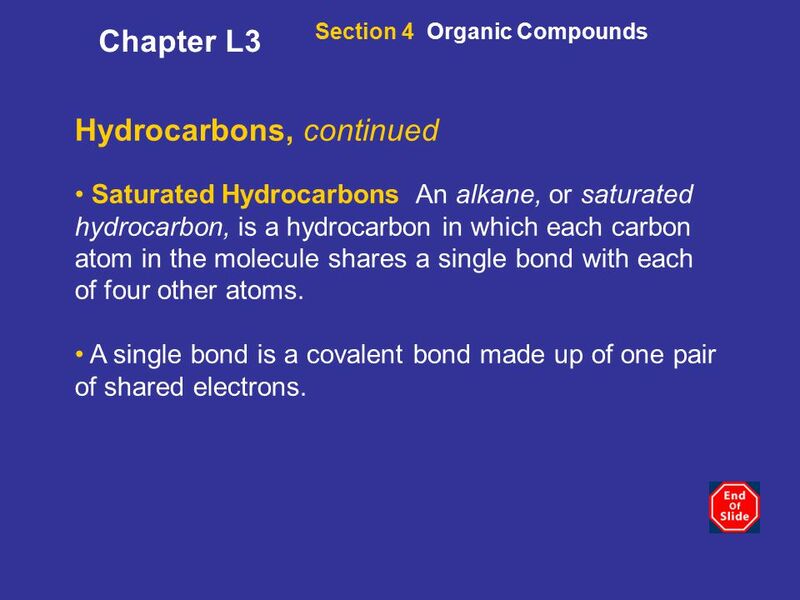 Chapter L3 Section 4 Organic Compounds Hydrocarbons, continued Compounds that contain two carbon atoms connected by a double bond are called alkenes. 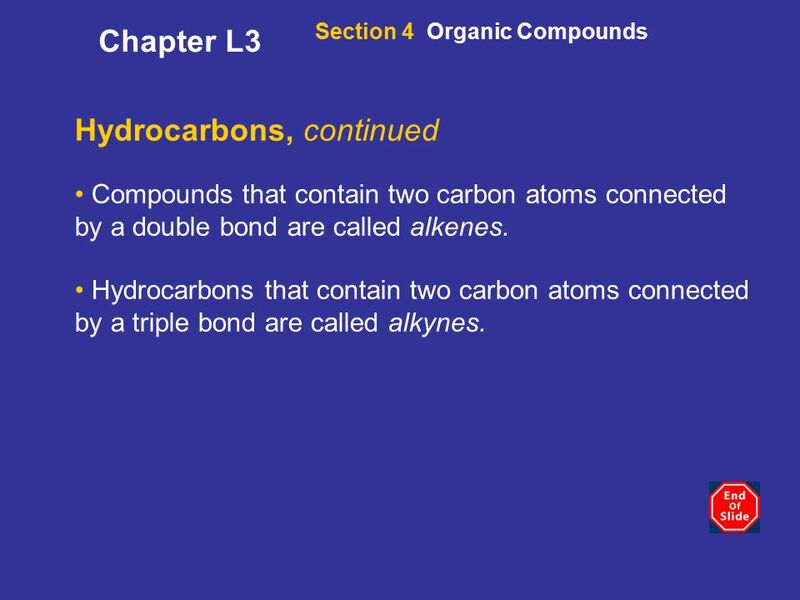 Hydrocarbons that contain two carbon atoms connected by a triple bond are called alkynes. 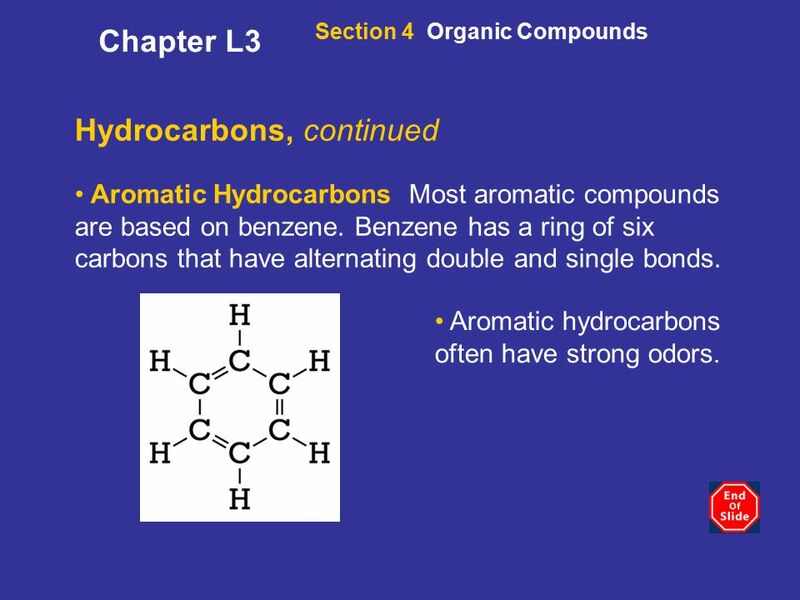 Chapter L3 Section 4 Organic Compounds Hydrocarbons, continued Aromatic Hydrocarbons Most aromatic compounds are based on benzene. Benzene has a ring of six carbons that have alternating double and single bonds. Aromatic hydrocarbons often have strong odors. 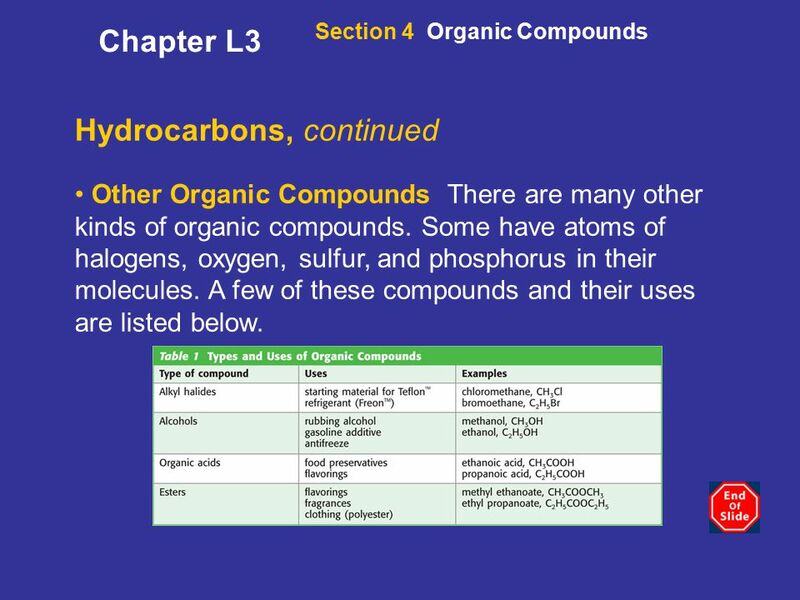 Chapter L3 Section 4 Organic Compounds Hydrocarbons, continued Other Organic Compounds There are many other kinds of organic compounds. Some have atoms of halogens, oxygen, sulfur, and phosphorus in their molecules. A few of these compounds and their uses are listed below. 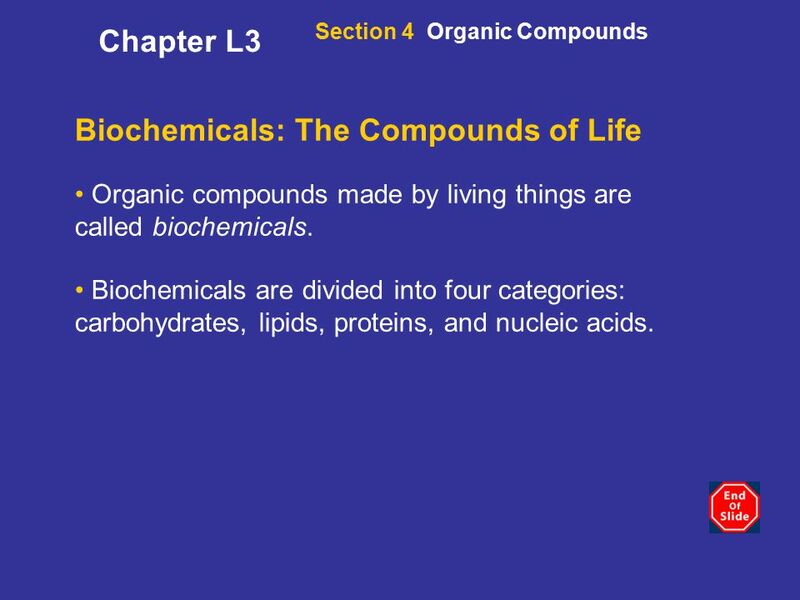 Chapter L3 Section 4 Organic Compounds Biochemicals: The Compounds of Life Organic compounds made by living things are called biochemicals. Biochemicals are divided into four categories: carbohydrates, lipids, proteins, and nucleic acids. 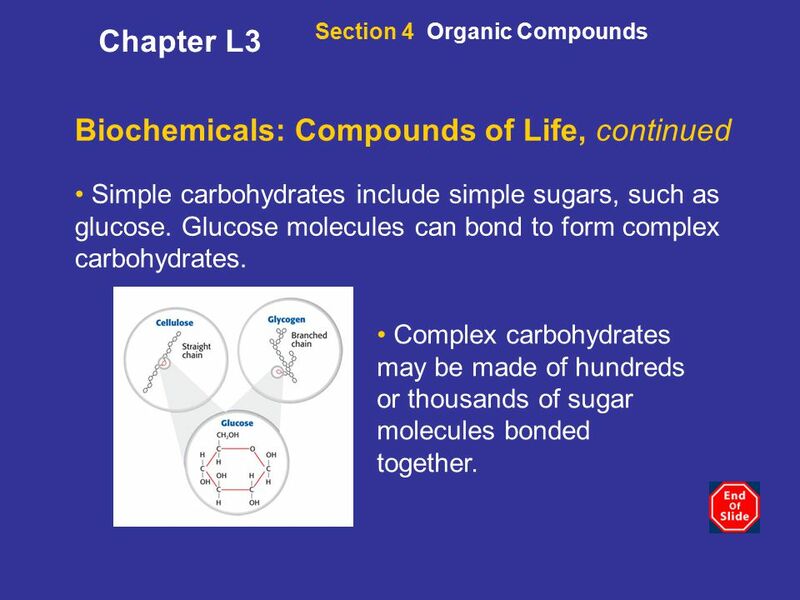 Chapter L3 Section 4 Organic Compounds Biochemicals: Compounds of Life, continued Carbohydrates are biochemicals composed of one or more simple sugar molecules bonded together. Carbohydrates are used as a source of energy. There are two kinds of carbohydrates: simple carbohydrates and complex carbohydrates. 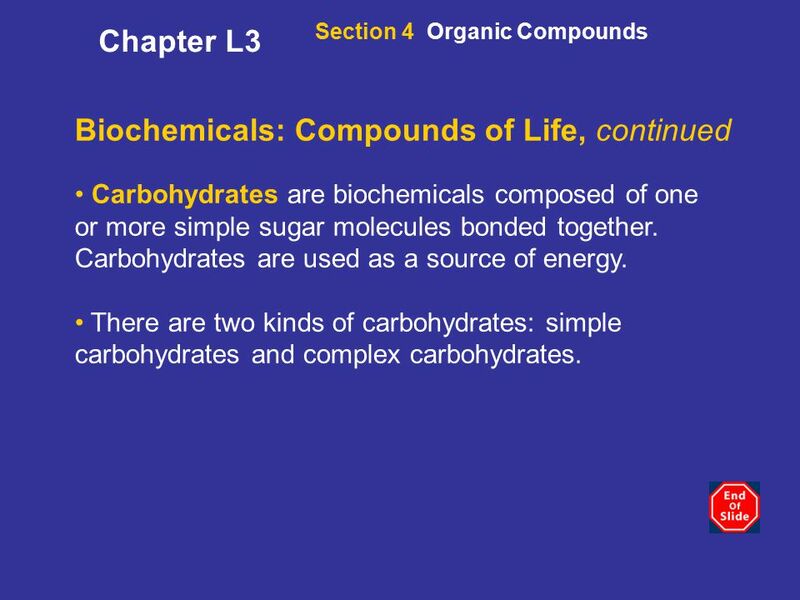 Chapter L3 Section 4 Organic Compounds Biochemicals: Compounds of Life, continued Simple carbohydrates include simple sugars, such as glucose. Glucose molecules can bond to form complex carbohydrates. Complex carbohydrates may be made of hundreds or thousands of sugar molecules bonded together. 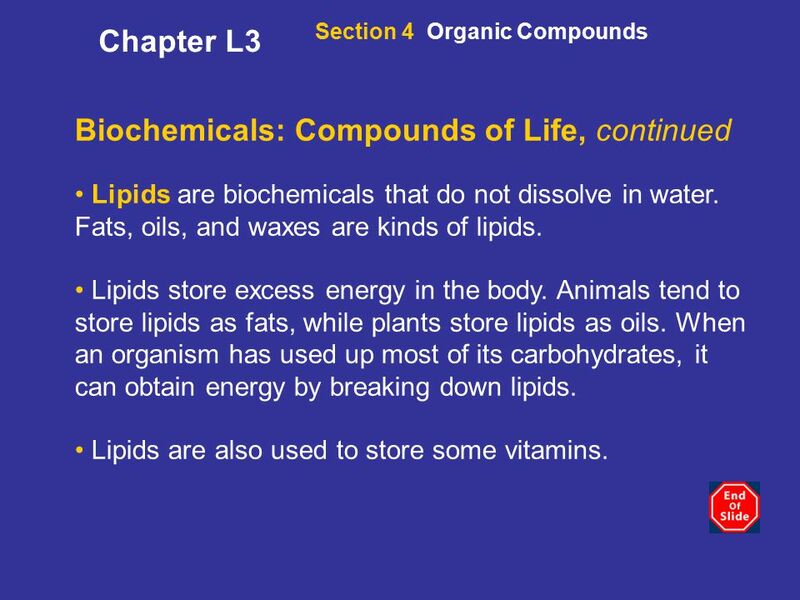 Chapter L3 Section 4 Organic Compounds Biochemicals: Compounds of Life, continued Lipids are biochemicals that do not dissolve in water. Fats, oils, and waxes are kinds of lipids. Lipids store excess energy in the body. Animals tend to store lipids as fats, while plants store lipids as oils. When an organism has used up most of its carbohydrates, it can obtain energy by breaking down lipids. Lipids are also used to store some vitamins. 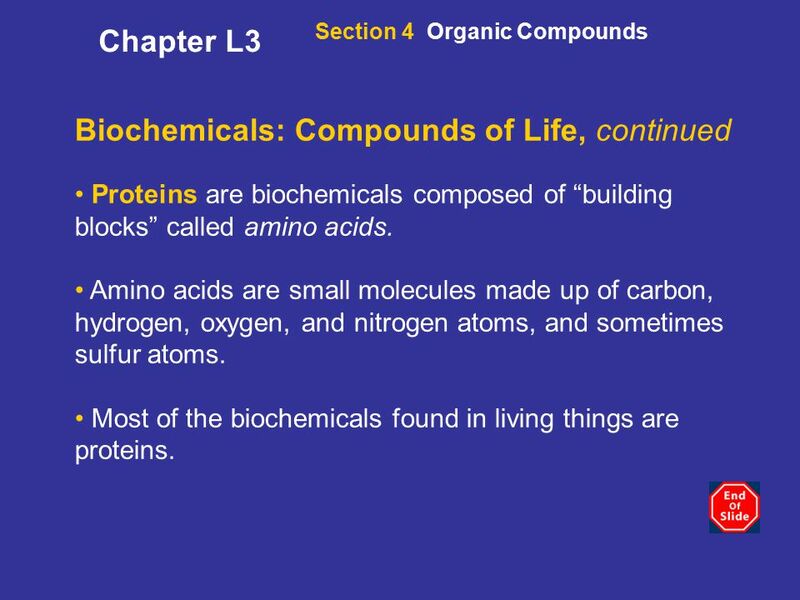 Chapter L3 Section 4 Organic Compounds Biochemicals: Compounds of Life, continued Proteins are biochemicals composed of “building blocks” called amino acids. Amino acids are small molecules made up of carbon, hydrogen, oxygen, and nitrogen atoms, and sometimes sulfur atoms. Most of the biochemicals found in living things are proteins. 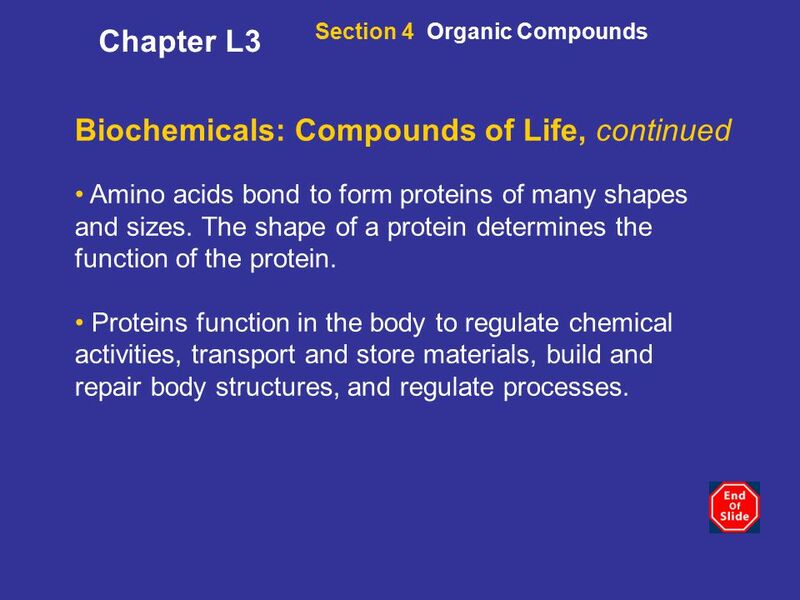 Chapter L3 Section 4 Organic Compounds Biochemicals: Compounds of Life, continued Amino acids bond to form proteins of many shapes and sizes. The shape of a protein determines the function of the protein. Proteins function in the body to regulate chemical activities, transport and store materials, build and repair body structures, and regulate processes. 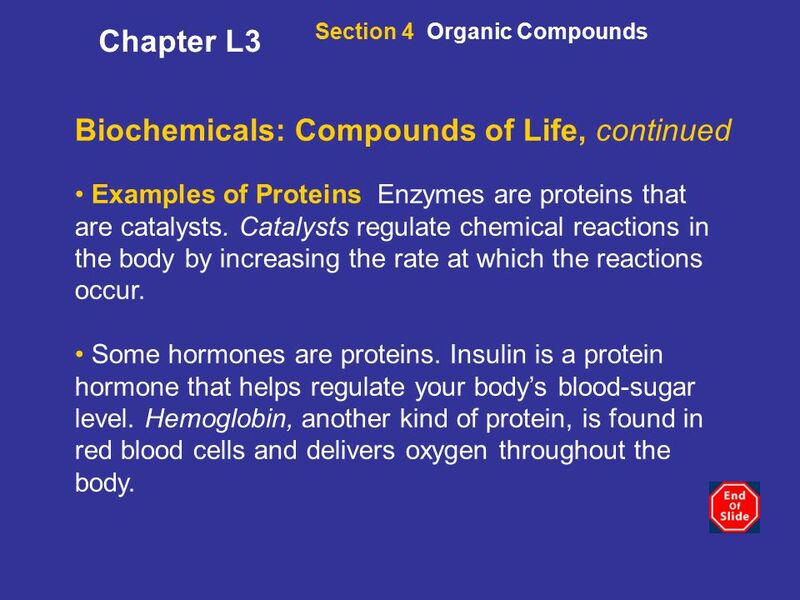 Chapter L3 Section 4 Organic Compounds Biochemicals: Compounds of Life, continued Examples of Proteins Enzymes are proteins that are catalysts. Catalysts regulate chemical reactions in the body by increasing the rate at which the reactions occur. Some hormones are proteins. Insulin is a protein hormone that helps regulate your body’s blood-sugar level. Hemoglobin, another kind of protein, is found in red blood cells and delivers oxygen throughout the body. 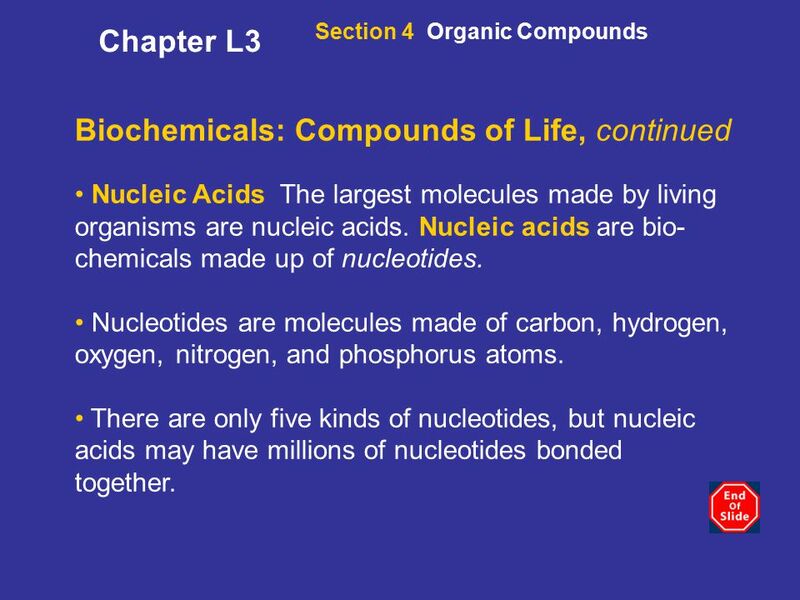 Chapter L3 Section 4 Organic Compounds Biochemicals: Compounds of Life, continued Nucleic Acids The largest molecules made by living organisms are nucleic acids. Nucleic acids are bio-chemicals made up of nucleotides. Nucleotides are molecules made of carbon, hydrogen, oxygen, nitrogen, and phosphorus atoms. There are only five kinds of nucleotides, but nucleic acids may have millions of nucleotides bonded together. 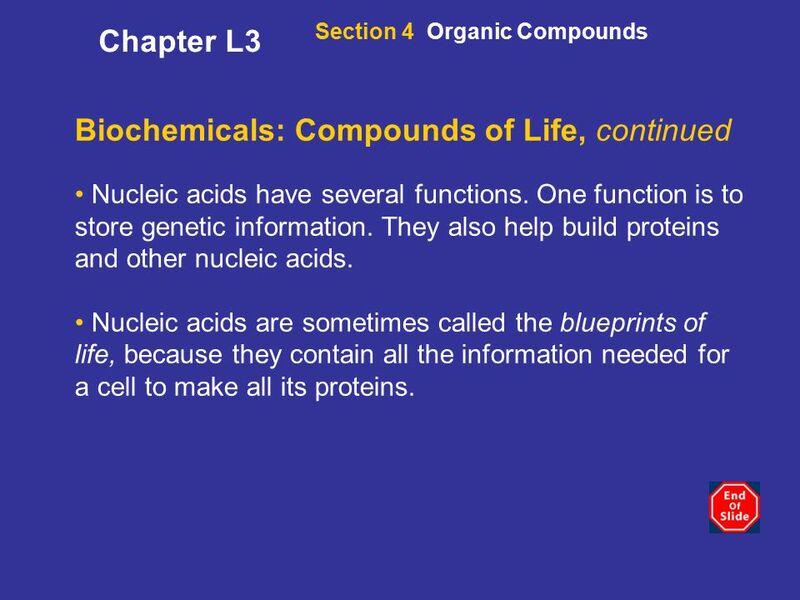 Chapter L3 Section 4 Organic Compounds Biochemicals: Compounds of Life, continued Nucleic acids have several functions. One function is to store genetic information. They also help build proteins and other nucleic acids. Nucleic acids are sometimes called the blueprints of life, because they contain all the information needed for a cell to make all its proteins. 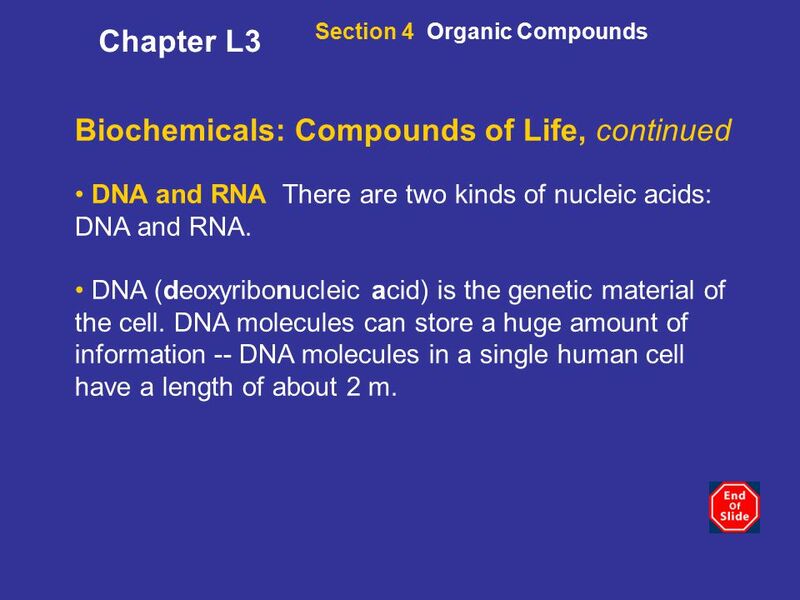 Chapter L3 Section 4 Organic Compounds Biochemicals: Compounds of Life, continued DNA and RNA There are two kinds of nucleic acids: DNA and RNA. DNA (deoxyribonucleic acid) is the genetic material of the cell. 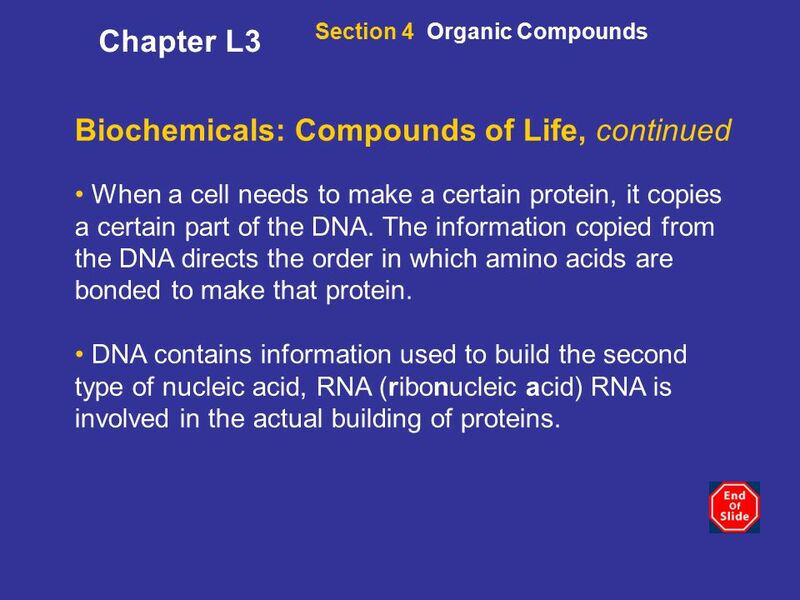 DNA molecules can store a huge amount of information -- DNA molecules in a single human cell have a length of about 2 m.
Chapter L3 Section 4 Organic Compounds Biochemicals: Compounds of Life, continued When a cell needs to make a certain protein, it copies a certain part of the DNA. The information copied from the DNA directs the order in which amino acids are bonded to make that protein. DNA contains information used to build the second type of nucleic acid, RNA (ribonucleic acid) RNA is involved in the actual building of proteins. 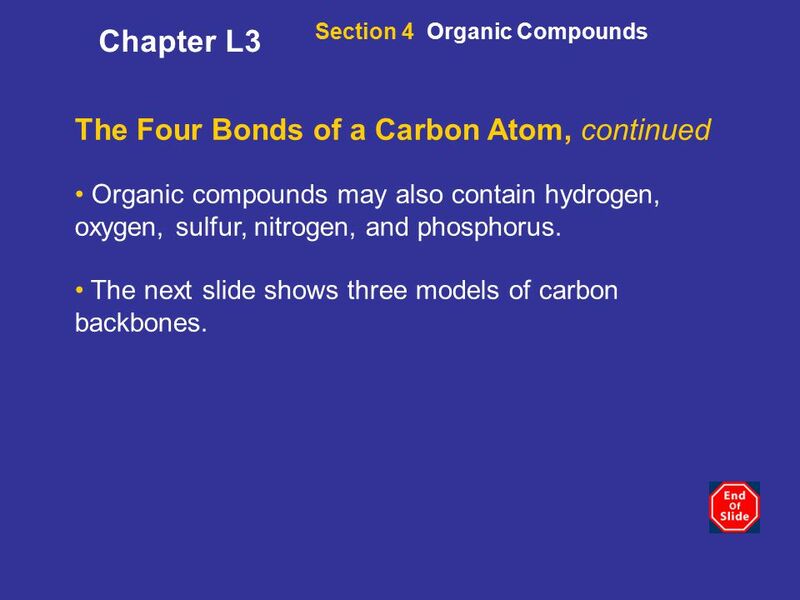 Download ppt "The Four Bonds of a Carbon Atom"
Slide 1 of 37 Copyright Pearson Prentice Hall 2–3 Carbon Compounds. 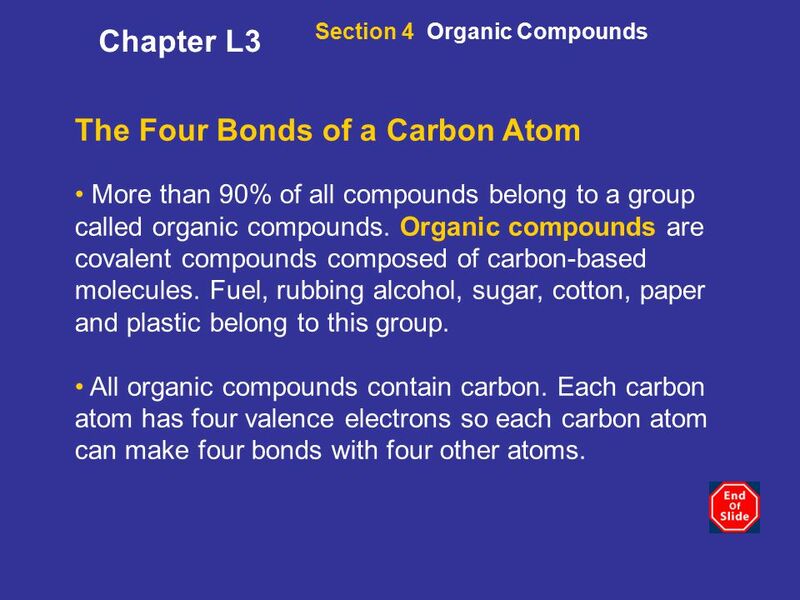 Carbon Compounds Chapter 2 Section 3. Pp  A carbon atom has 4 electrons available for bonding in its outer energy level.  To become stable, a carbon atom forms 4 covalent bonds. Chapter 2: Chemistry of Life 1. Organic chemistry is the study of all compounds that contain bonds between carbon atoms.